It was Saturday, October 13, 2012, and I was woken up suddenly at 5:45am by a familiar motherly voice, which instructed me to get up and go the window of the hotel room and look outside to see “the sign”. 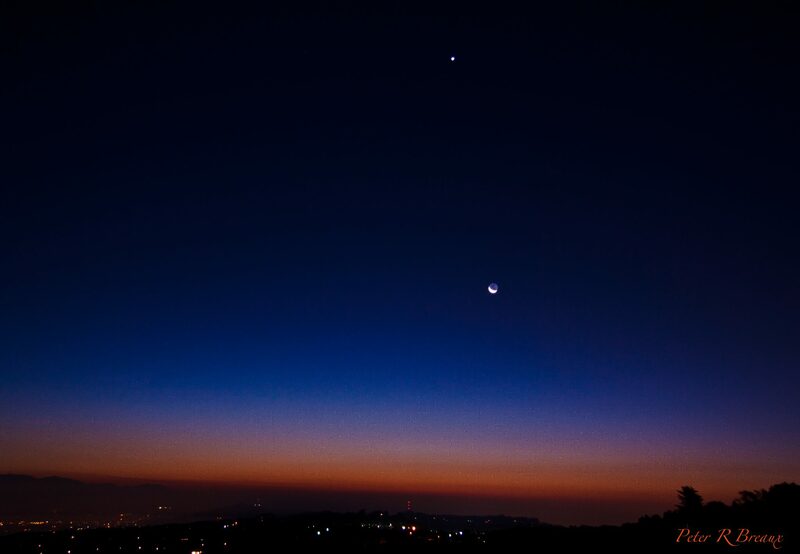 As I opened the curtain, I saw the Morning Star (Venus) straight out high in the eastern sky. 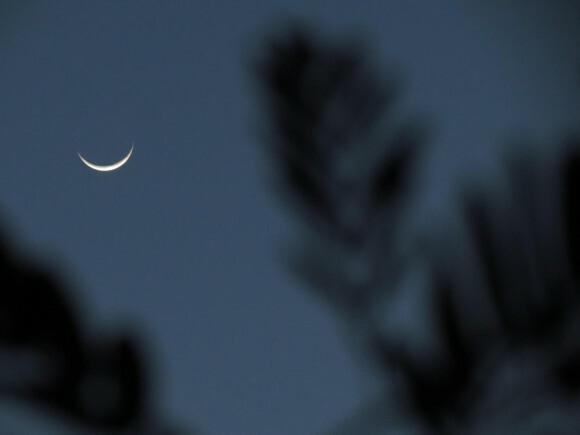 Directly below it was the brightly illuminated, very beautiful crescent moon (facing upward). And straight below it on the horizon was the still faint, dawning light of the rising sun about to announce the new day. Moving in the Spirit, I knew this was a sign from above. I understood this sign was a gift to me from Our Lady. And it was especially for me. A few moments later, as the heavenly constellations shifted, the sign was gone. I had been stirred and directed to see it at a perfect moment, and the sight made me feel overwhelmed with a sense of God’s presence and love. Though I did not remember it at the time, about nine days previously I had begun a novena asking the Lord and His Mother whether this work of spreading the heavenly message of our times was important, whether I was cut out for it (or could survive it), and whether God wanted me to continue doing this work as part of His Will. As a confirmation to my novena’s intention, I had been asking Our Lady for a double sign – for literally two signs that were distinct but the same, to confirm that this was God’s plan for me. I did not know what I was asking for or what kind of signs I might receive. And on this morning, I had not connected the sign in the sky I received with the novena or its intention. Not yet. I spent that weekend in mid-October speaking at a diocesan conference in Fargo, North Dakota, this being my first time there. And it was a blessed and fruitful weekend. After the conference, before I flew home on Monday morning, I woke up early before dawn to walk to morning Mass at the cathedral. There was no sign of the moon now, and the sun was not yet dawning. All was chilly and dark. So, I was on my own, or so I thought. On my way through downtown, I came across two men standing in front of a closed building. As I walked by, they said: “Good morning, Dr. Bowring.” Surprised, I soon learned they had attended the conference and were up early praying in front of an abortion clinic. Wondering what I was doing there, I explained to them that I was on my way to Mass. They told me I would never make it, as I was going in the wrong direction. So, redirected with their guardian-angel-like help, I made it to the Cathedral of St. Mary as Mass began. After Mass I stayed to pray the Rosary. In the middle of the Rosary, with my head lowered, I heard the same voice that had spoken to me the earlier morning, which now said gently: “Kelly, look up. I have the second sign for you.” As I was listening to the voice, at that moment I recalled my previous request for a double sign as part of my prior week’s novena; and I now had a clear sense that I was being given the second sign as confirmation of that prayer. So I looked up seeing the altar area… and there was the sign. 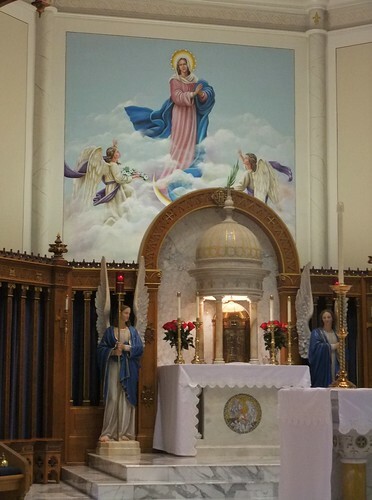 I saw a star among several stars high on the wall behind the altar, below it was the image of Mary standing on a crescent moon, and below this was the tabernacle with a light shining on it causing a radiant glow that made it look like a rising sun. It was the exact sign I had seen in the sky the morning of two days prior, but now with more religious significance. I was both stunned and filled with joy. I had now received two signs as requested – a sign from nature and a sign from grace, both distinct yet both the same, and both given from above. My prayer was answered in a way I could not have imagined. And I knew what this meant. I was being called to continue proclaiming the heavenly Message of our times. And I believe you are as well. This book is about the heavenly Message and Signs of our times, which are coming to us today from the heart of the Church through the Popes, Saints and Mystics, and from the Hearts of Jesus and Mary. I think that God wants you to realize that each of you reading the Message of this book is being called by Our Lady, who is standing on the moon as the New Ark, and who is coming from Heaven today to prepare us for the New Era of her Son, which is just on the horizon of our time. This is a Message of hope! And like the Morning Star, God wants us to be a light for others and to be one of His signs of hope in these times. This is not about the end of the world, but about a new Kingdom about to dawn for the world. I hope you enjoy this book and that you share it with others because the world is today in darkness and needs urgently to hear the ‘good news’ that a new day of Christ is indeed dawning and is almost here. And – as you will see discussed in this book – by witnessing the Signs of the times that becoming increasingly evident today, God is showing us the time is now!